Victoria focuses on delivering profitable growth, both through acquisition and organic initiatives. The Company supplies the mid-to-high end of its respective markets, selling primarily direct to retailers. Its 3000+ UK customers range from independent retailers to distributors and large format chains like John Lewis. The business is overwhelmingly focused on the home improvement market, insulating it from the more cyclical industries like construction. The Company’s manufacturing facilities are well-invested and highly efficient. With only 10% of its cost base fully fixed, the business is able to respond quickly to changes in demand. 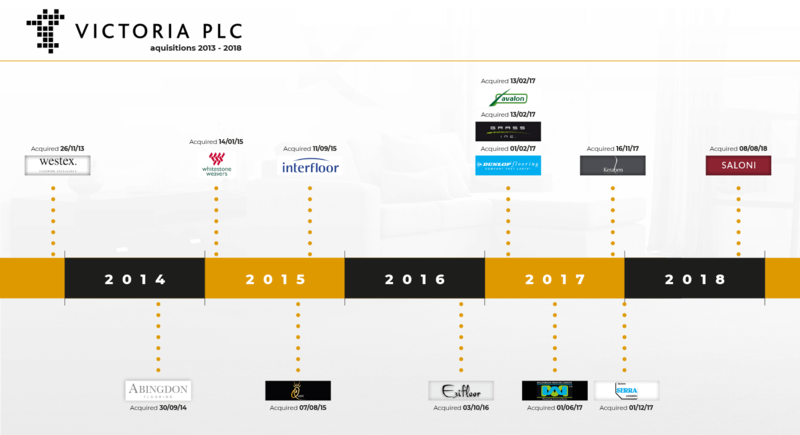 Victoria PLC has a demonstrable track record of integrating acquired businesses and using cashflow to de-lever. Commercial synergies include leveraging the distribution networks and the ability to cross-sell bundled products, such as underlay. Organic growth in the business is fundamentally driven by the five pillars of the business model. In addition, the Group continues to seek and deliver synergies and transfer best operating practice between acquired businesses, both in terms of commercial upside, and cost and efficiency benefits to drive like-for-like margin improvement. Offering a range of leading quality and complementary flooring products across a number of different brands, styles and price points, focused on the mid-to-upper end of the market. Highly motivated, independent and appropriately incentivised sales teams across each brand and product range, ensuring delivery of a premium service and driving profitable growth. Multiple production sites with the flexibility, capacity and cost structure to vary production levels as appropriate, in order to maintain a low level of operational gearing and maximise overall efficiency. Appropriate investment to ensure long-term quality and sustainability, whilst maintaining a focus on cost of capital and return on investment. Flat structure with a team of sixteen senior managers running the daily business with income statement ‘ownership’ and linked incentivisation, and who work closely with the PLC Board to plan and implement the medium-term strategy.